I can't believe it's already the last week of January. I just returned from Salt Lake City where I attended Alt Summit, a conference for bloggers. My mind is overflowing with ideas and inspiration. (Perfect considering my 14 for 2014 list.) I made a lot of great connections, and I can't wait to get some collaborations going. But for now, I'm back to work. I landed, took a quick nap, then hit the ground running for a good solid twelve hours of editing and email-answering. 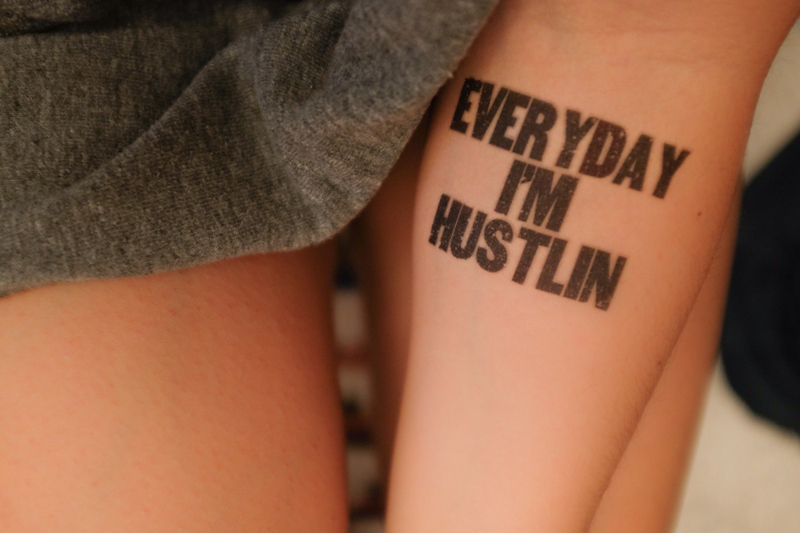 In my head I'm singing "everyday I'm hustlin'". Actually, I'm always singing it. So it was pretty obvious to pick it as a tattoo (from Tattly). I got to say… I'm pretty happy. I love that I have work. Yes, I'm stressed, but I'm definitely grateful that I'm surviving, even thriving. holla!